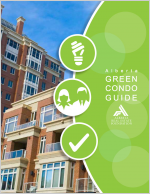 The Green Condo Guide for Alberta outlines how to capitalize on energy saving opportunities in common areas of a condominium, including centralized heating, cooling and ventilation systems and lighting. Reducing a building’s energy bills is a huge opportunity to save money and reduce a building’s impact on the environment. In fact, at least 40 per cent of a condominium building’s operating costs go to gas, electricity and water bills, making utilities the largest controllable expense for any condo corporation. And most older condos can cut these costs by 30 per cent by doing a few upgrades, adding more efficient lighting or boilers. Even a newer building can realize savings of at least 15 per cent. This simple to follow and easy to read 14-page guide outlines a number of steps that will not only reduce a condo’s energy use—saving money and reducing emissions—it will result in a more comfortable and well maintained building. The step-by-step overview of how you can green a condo begins with information on how to baseline and benchmark a building’s energy use, perform an energy audit and set goals. Next, it goes through a high level explanation of how to identify opportunities for improvement, assess the business case for upgrades and improvements and develop and track a retrofit plan. A good energy retrofit will help protect the capital that’s invested in a condo by ensuring the building’s systems are in good operational order and operating costs are under control. A green building is comfortable and cost-efficient, which protects an owner’s investment and is more attractive to buyers. The Green Condo Guide for Alberta, funded in part with a grant from AREF, is based on work originated by the Toronto Atmospheric Fund (TAF) and adapted for Alberta by the Pembina Institute.